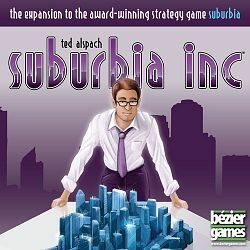 The expansion for the award-winning strategy game Suburbia! Your borough has decided that it’s time to incorporate: What does that mean for you, as the city planner? Well, lots more paperwork, that’s for sure. But it also gives you great new possibilities for your little town. Define borders that are unique and provide you with all new benefits. Build more than a dozen new, powerful buildings to optimize your income and reputation. And take advantage of new Bonuses (to increase your income) and Challenges (to boost your reputation) by achieving mid-game goals.